Weathermen can't predict exactly where thunderstorms will hit but they've been pretty accurate predicting the high temp for the day. This was my second time fishing the Haw and again my temp gauge in the car read 92 degrees. I saw a familiar car in the parking lot and I was happy to see my buddy Dave was already on the water. The water level had raised some since the last time I visited. I met up with Dave and he informed me the fishing had been pretty slow. I tried the usual spots where I knew fish held and instantly had a sunfish hit my gulley fish fly. I wasn't targeting sunfish today, I was going for largemouth. I kept working water hitting pools here and there. The sunfish were in every piece of slack water. I also found I would have to start stripping before my fly even hit the water. If I didn't I would miss several strikes. The pools looked great but I couldn't seem to find bass. As I went up stream I saw a section under a tree where I was positive a bass had to be. My assumption was right and on my first cast I pulled in my first Haw largemouth. The fish was only about 10 inches but I was really happy to finally catch one. The fishing started to warm up with the weather. I caught several sunfish and when I cast towards a pool near a downed tree something slammed my line. The fish swam away for a second then bee lined towards me. I could barely strip fast enough to stay ahead of it. It was about a foot away when I raised the rod and the fish swam as though it was trying to bury itself into the ground. I was starting to wonder if the fish was a bowfin or carp. 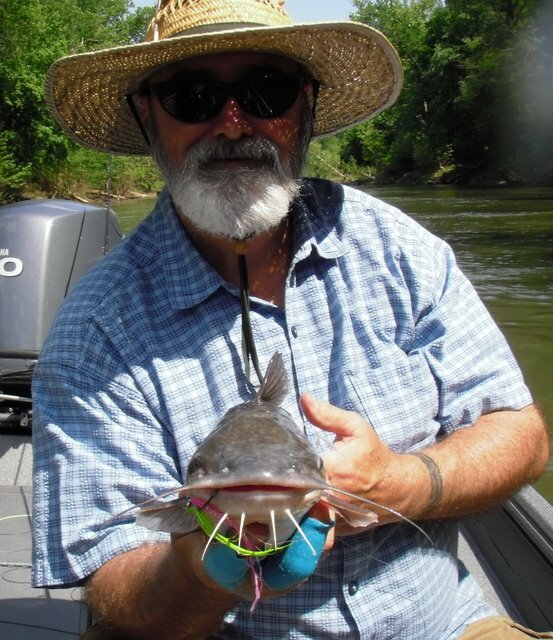 It wasn't until the fishes head came up that I realized it was a catfish. This was the biggest one I have caught this year. The fishing kept going with sunfish here and there. The wading was a little sketchy with the water being so murky. I decided to call it a day. When I turned around to go upstream I saw a view that was out of a dream. The picture doesn't do it justice. It was topped off with a osprey flying by me with a good size fish. The bird was maybe 20ft away. It was a neat moment and one that will make me view the Haw a little more fondly. Carp are frustrating fish. The worst thing that can happen for someone fishing for carp is to catch one on your first attempt. This will give you the impression that fishing for them is easy. It is anything but. I wouldn't think it was wrong to say carp are one of the hardest fish to fly fish for. The fish are very selective and spook at the slightest sense that something is wrong. When bank fishing for them, you need nerves of steel. 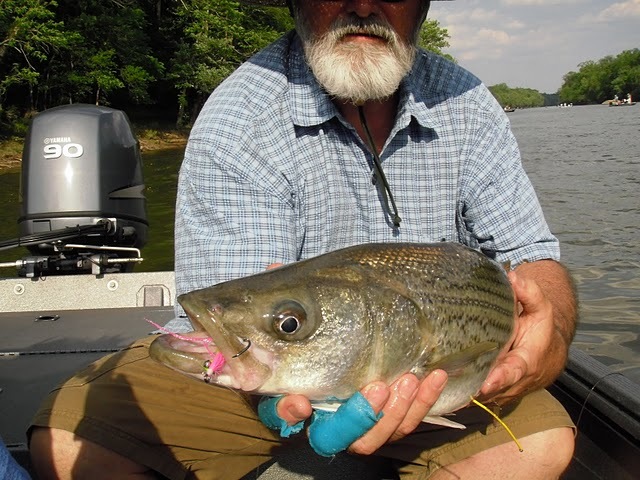 A sudden stumble, false cast or splash can ruin any attempt at catching a fish. Just casting for a carp can be a challenge. I decided to take a video of some of the carp at a pond I frequently fish. I'm not sure how big these carp were but I'm thinking easily over 10lbs. Fishermen are classified in many different ways. When I first started getting into fly fishing there was always a stigma around people who wore Fedora's. The assumption was these were uppity snob type characters. 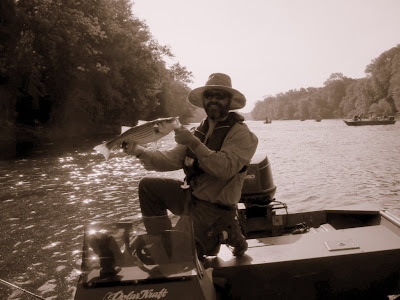 People who believe all fish should be caught on a dry fly and would never be seen by their peers tying on a egg pattern or god forbid a San Juan Worm. When you first view Orvis adds with photos of well outfitted fisherman wearing Fedora's you can get that impression. Now that I've gotten older and hung out with men wiser than me. I noticed most of them wore a wide brimmed hat. Many of these guys are well off but far from snobs. The idea was to keep the sun off you not make a fashion statement or display a certain status on the water. 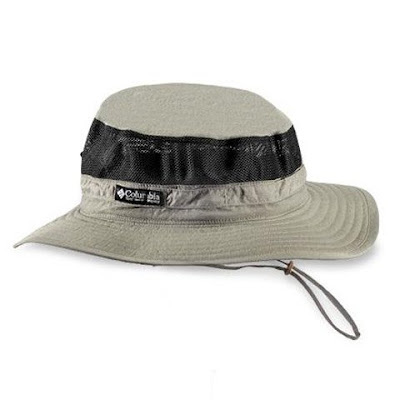 I started looking at floppy wide brimmed hats every time I entered a sporting goods store. I even held them in my hands a couple times and looked around to see if anyone was watching before trying them on. I still couldn't get passed my own personal ideas of floppy hat wearers. I think of Gilligan or really old geezer type fisherman with tons of flies and lures sticking everywhere. What finally made me purchase one was thinking about life and how long I want to live it. Several TFF members have had skin cancer. I know I spend more time in sunny conditions than most people. I really don't want to go through any situation where I need surgery. I finally came up with the philosophy that it was better to look silly to others and live than look cool and die. So yesterday was my beginning as a floppy hat wearer. My friend and I were fishing the work ponds to catch some bluegill and bass. We found decent areas where bass were holding but they weren't very aggressive. The other obstacle was the 10 or so sunfish that would chase down and peck your fly before any bass had a chance to even get close. I caught a few bass on poppers that were too big for the gills to get hooked. Then I switched over to a carp killer fly. I cast near a over hanging bush and saw a bass swim towards where the fly landed. My line went taught but when I went to set the hook I didn't feel any pressure. I saw the fish swimming kind of funny so I lifted my rod again and then saw the flash of a hooked fish. When the fish came closer I noticed it had not only inhaled the fly but swallowed it. Almost to where it was in the fishes stomach. I thought about cutting the line, but I figured the fish wouldn't live. My bag wasn't close so I had to borrow a friends pair of pliers. I tried and tried to get the hook out. The barb was still in it making it difficult but also the location of the hook set couldn't have been worse. After prying and prodding the fish started to bleed and I knew I was just causing more damage. My buddy took over but had similar problems. The hook was just too deep, he finally got it out but we knew the fish had a pretty grim fate. Now comes the guilt trip of what do you do with the fish? Probably what we should have done as brutal as it sounds is killed the fish instantly with a knife or rock. The fish lover in us wants to believe a fish can survive any punishment we put it through. No catch and release fisherman wants to be responsible for a dead fish. The fish was really too small and we had nothing to keep it in to take it and find someone who might eat it. Honestly we probably would never find anyone any how. My childhood ignorance stepped in for a minute and I said we should just throw it in the bushes. Thinking it will be just a part of the food chain. My friend being an optimist figured the fish would live even though its life fluid was draining down his hand as he threw the fish back in. What had just happened really bothered me and I couldn't help but feel really guilty as I walked over to my fish pack and smashed the hook barb down relieving some of the frustration. Yeah it's just a fish but if the barb was smashed down the whole event could have been prevented. What was strange too was why was this bothering me so much, do I think about the fishes well being too much? Or is that really not possible? Tonight some friends and I checked out a section the TFF club may be adopting. After meeting up with everyone late because I had to go back for my boots and waders we got on the water. The Eno really has no ugly sections. The water was muddy but nothing I hadn't seen before. The section where I first started was a large pool. The water looked good upstream. and downstream. In the shallows I could see fish moving. When I cast close to shore I had a few hits on my popper but I couldn't keep the fish on. It took quite a few more casts but I started to get the hang of things. The fish were colorful and this one was the brightest color I had ever seen. You can see in the photo the legs of the popper I was using. I had several takes where the fish inhaled the fly, it couldn't be seen when the fish came to hand. The day went on with me catching sunnies here and there. The water had some nice features for fish cover. Submerged logs and decent size rocks just a tad smaller then what I would consider a boulder. There seemed to be sunfish in every small piece of slack water that was seen. The day ended with me catching a little bass on the white bugger pattern that's been the best this year. On the water my friends and I ran into one another. Everyone was having a pretty good day. The sections were like this and some had cover of trees that hung over the bank. The Eno really is a piece of water that is under rated. I haven't heard of too many people that target bluegill. They are usually an after thought when nothing else is biting. I can't say I'm not one of those people. When I really think about it though, bluegill are pretty fun fish to catch. First off, they hit top water flies like something straight out of Jaws. Second they are plentiful. Where there's one there's usually a few more. They hang out in swarms and usually you can sight fish for them. Sometimes an effective technique is to see one come towards your fly if it turns around, twitch your fly some. If another gill sees this and comes towards it, usually that will attract more. When two or three gills are coming at your fly from different directions the competitive instinct takes over and some will hit it I believe just to be the first to get the bug. I've seen cruising bass follow this same behavior as well. A lone bass will sometimes come up sniff a fly then move on. But 3 cruising bass will usually race to the fly and the one in the lead will hit it. 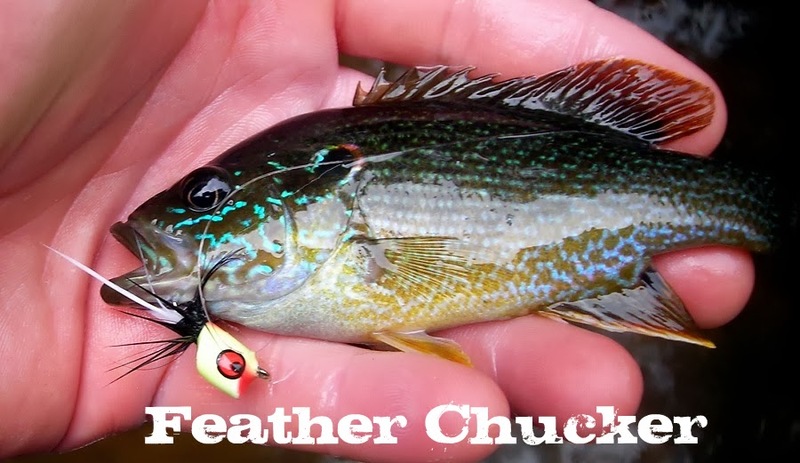 In the following video I try to show how easy it is to catch bluegill on a fly. I believe I'm using a caddis but to be honest I can't remember. Any high floating fly will do the job, hoppers, popper, caddis, humpy. Something that floats high and has rubber legs will do the job. If you notice on my third cast the fish hits the fly about 10-15ft from shore. Really most bluegill swarms aren't more than 10ft from shore. My casts in this video are really way over where they need to be. I was just trying to see how far I could cast as well as catch fish. I will try to show more movies on how ferocious gills are and different techniques to catch them. I'm no bluegill expert but I have a pond near me that's very clear and I think it will be great for demonstrating their behavior. Today was the TFF Striper trip and I was hoping for a day as good or better than the one I had a couple days prior. A buddy and I arrived at the boat ramp at 8am and were quickly in the water. The parking lot was full and the boat traffic was pretty thick. I was trying a new set up that I wasn't sure was going to work. I took my sinking 5wt line and put it on my 8wt rod with a T14 25ft. A pink and white clouser was the hot fly for me last time, so I tied one on and through it over board and let some line out. I stripped in getting ready to make a real cast and a fish hammered the line. While bringing the fish in I was excited to see it was bigger than any striper I have caught. 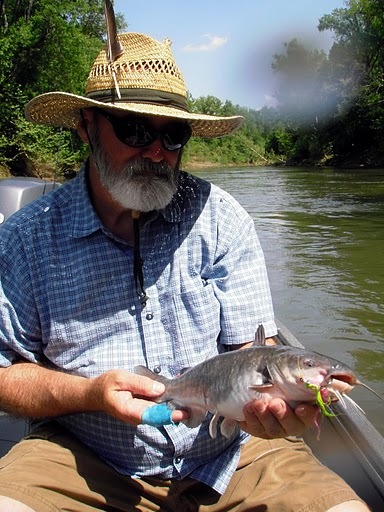 Catching a fish on your first cast can be a blessing or a curse. It usually means the day is going to be outrageously good or horrible. Unfortunately for us it was the latter. It was nice being the water and enjoying each others company but the fishing was tough. We tried places all over the river with little success. There were people using bait that seemed to be catching fish some what consistent. Even when we tried fishing the same seem they were using we couldn't hook up. The place we began ended up being the only spot that was productive. The day ended with a couple fish for the both of us. I had fun but it was a pretty forgettable day otherwise. Brian was good company as always and I think we do a good job of keeping the mood light. It was fun seeing other club members on the water. Many of them were having the same kinda day. I'm thankful there were no mishaps or injuries. A few more fish wouldn't have hurt. Labels: Brian, Stripers, TFF Trip, Weldon. 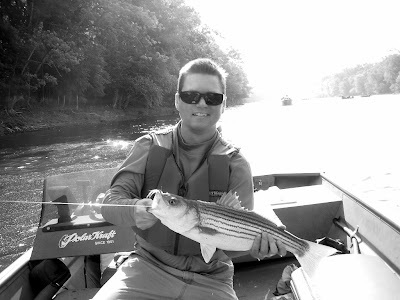 Striper fishing is something I am still getting used too. There is definitely a certain technique to it. 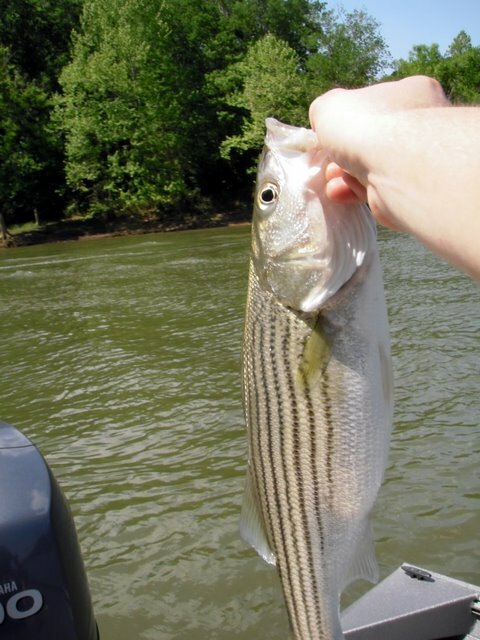 I have a friend who is an expert at striper fishing and he was nice enough to invite me fishing. Since it was a weekday I figured the river would not be that crowded. When I arrived in the parking lot there were quite a few trucks with trailers parked. It was surprising how much traffic was on the water. We gathered our gear and launched the boat. This was the first time I've been to Weldon where you could see the rocks and rapids. The last few times the water was so high you couldn't see these rocks. 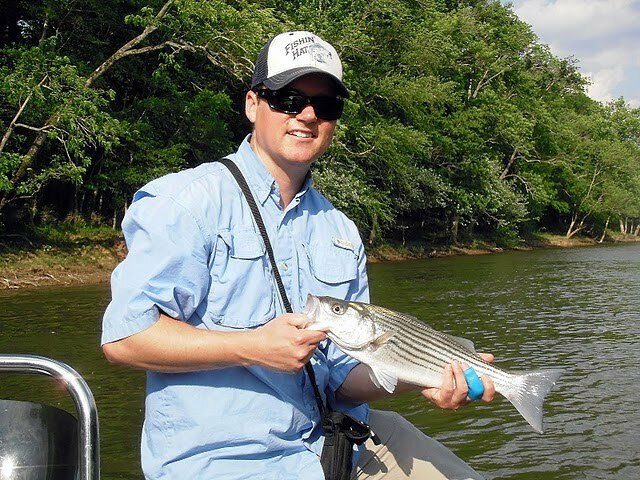 It didn't take long to hook into my first striper. The fly used was a tutti-fruity. The fly is a chartreuse and pink clouser. we continued to drift with out much success, so we decided to try the little river. After some wild life watching and good conversation. Jim hooked up with a fat catfish. It looked like it swallowed a softball. A couple more fish were caught and we made our way to a usual hot spot. It was here that we spent the rest of the day. The fishing wasn't really hot but we were averaging a fish every 30min. I was starting to get the hang of how to catch the fish. It seemed quick strips with a short pause in between was best. Jim was doing the same but with an even shorter pause. The retrieval really seemed to be the key more than what fly you used. We did have success on pink/white, green/white, green/yellow and some con caution I made. It is green and orange with a pink chenille body. More pics to come. The highlight of the day came when Jim hooked up with a lunker. It was giving a nice tug on his 9wt rod so I figured it had to be a good fish. I asked if he needed the net and he responded with "OH YEAH!" I could tell from how he was telling me what he was gonna do that he might not forgive me if I knocked the fish off. I ended up netting the fish fine. It was a fat 25-30 inch striper. Close to 10lbs. It had a tag on it and we meant to get the number off for the fishing biologists but we didn't and released the fish. Maybe they would recognize the fish if we sent them the picture. They only tag a few thousand a year. 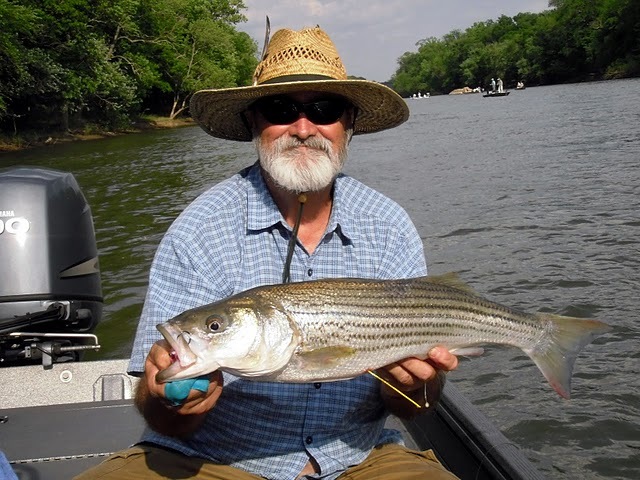 Labels: big striper, striper fishing, Stripers, Weldon.